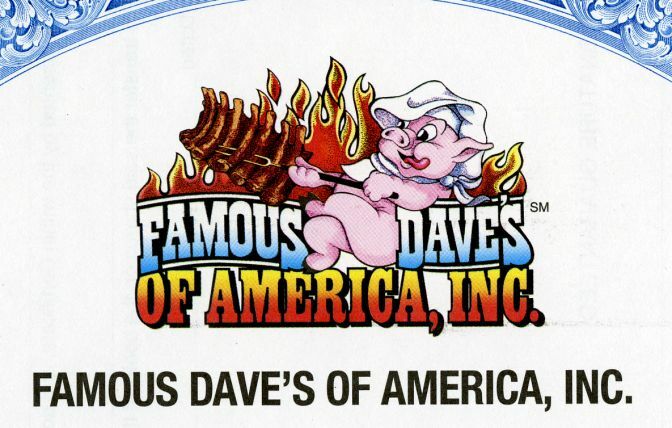 Home > Health Care, Food, Beer, Retail, Tobacco > Food, Beer and Beverage A-I > Famous Dave's of America, Inc. Beautifully engraved certificate from the Famous Dave's of America, Inc. 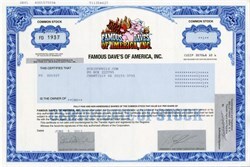 This historic document was printed by the United States Banknote Company and has an ornate border around it with an image of Famous Dave's logo. This item has the printed signatures of the Company’s President and Secretary. Famous Dave's of America, Inc. develops, owns, operates and franchises barbeque restaurants. As of today, the company owns 53 locations and franchises 133 additional units in 35 states and one Canadian province. Its menu features award-winning barbequed and grilled meats, an ample selection of salads, side items and sandwiches, and unique made-from-scratch desserts.